Something for everyone, a museum, archives, genealogy centre, gift shop and venue for educational and social events. Try a search on "HAGGIS" the online search tool for photos, wills, documents, genealogies and much more re Pictou County people. More info added regularly. A partner in the Ship Hector Descendant Project. Nova Scotia Archives online where you can search and view birth, marriage and death certificates. Excellent resource! A grass roots, volunteer run, genealogy society with local history knowledge and a great collection of genealogy resources. Located in the "Roots" room at the New Glasgow Library. A partner in the Ship Hector Descendants Project. 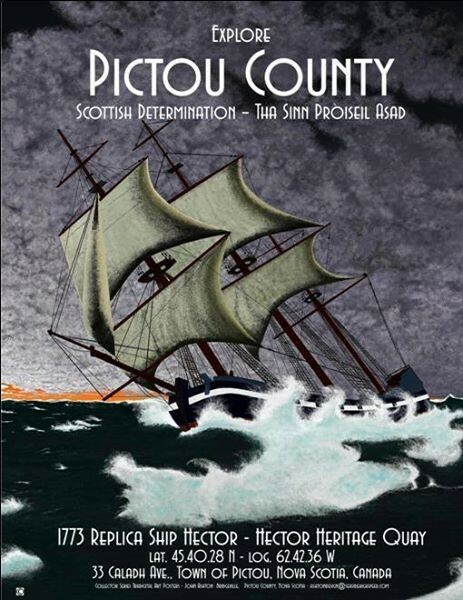 Need help finding your Pictou County ancestor? A local researcher can provide research assistance, insight and guidance on "Pictou County" resources. Reasonable rates. A new tourism site featuring information re events in and around historic Pictou, where to stay, eat, play and much more. A site you will want to bookmark when planning a trip to Pictou. The home of the Ship Hector replica in Pictou, Nova Scotia and a partner in the Ship Hector Descendant Project. A must see on the Pictou waterfront. Visit the Town of Pictou and all the area has to offer. October is Family History Month.....is it time to? update your family tree? email your distant cousin? organize your family photos? join a local genealogy society? scan those documents? visit your ancestors grave? (if you are nearby). How will you celebrate Family History Month? SUMMER GREETINGS everyone! Hoping you are able to take some time to relax and enjoy some nice weather, at your favorite summer getaway/happy place! WELCOME to the second edition of the Ship Hector Descendants Project (SHDP) newsletter. There are now over 200 subscribers to this newsletter which is fantastic. Thanks for your continued interest in the project. WELCOME to the first edition of the Ship Hector Descendants Project (SHDP) newsletter. The project continues to grow and reach descendants from across North America. It is anticipated that the reach will grow to include descendants from across the globe!